My recent “Virtual List on Steroids” presentation at DIG-FM, and the preparation of a revised version to give at dotFMP next week, has prompted me to reconsider certain assumptions re: optimizing performance both locally, and across a LAN and/or WAN. Specifically, there are two things we’re going to look at today. First, a way to dramatically speed up sorting on related data. Then, having incorporated that trick into the Fast Summary approach, we will compare Fast Summaries vs. Multi-Finds under various scenarios. This entry was posted in Level: Intermediate, Version: FM 13 or later and tagged GetSummary on May 30, 2018 by Kevin Frank. Picking up where we left off in part 1, today we’re going to take a look at examples 2 through 6 in the Virtual List Charts demo file (the demo has been updated since part 1, so I recommend downloading a fresh copy). This entry was posted in Chart, Level: Advanced, Version: FM 13 or later and tagged Array, Chart, Choose, Fast Summary, GetSummary, Virtual List on May 17, 2014 by Kevin Frank. Today we’re going to look at applying the virtual list technique to FileMaker charting with the goal of producing a reusable chart “object”, or rather, a series of chart objects. We’ll need more than one because while certain attributes (e.g., chart title) can be set programmatically, others, including type (e.g., column or line), must be hard-coded into the chart object. We’ve already explored Bruce Robertson’s virtual list on this site a number of times, but briefly, you create a utility table in your solution to facilitate non-standard viewing, reporting, etc., and pre-populate it with “more records than you’ll ever need”. The records in this table will derive their data “virtually”, by parsing it from an array — typically one or more $$variables. This entry was posted in Chart, Level: Advanced, Version: FM 13 or later and tagged Array, Chart, Fast Summary, GetSummary, Virtual List on April 25, 2014 by Kevin Frank. This entry was posted in Level: Intermediate, Version: FM 13 or later and tagged GetSummary, Summary List, Unique on April 7, 2014 by Kevin Frank. …and today we have a demo file, FM-13-Count-Unique-v1, that extends the concept to sub-summary reporting. This entry was posted in Level: Intermediate, Version: FM 13 or later and tagged GetSummary, Multiline Key, Summary List, Unique on April 4, 2014 by Kevin Frank. Last time we looked at several summary reporting tricks, including a conditional subsummary (when an item’s Status is “Scheduled” it will have a value in the Substatus field — otherwise Substatus will be blank). The challenge was to generate a summary report showing Substatus only where appropriate, without seeing any annoying empty gray rows beneath Pending, Cancelled or Completed. And last week’s report worked fine… in preview mode. This entry was posted in Level: Intermediate, Version: FM 10 or later and tagged Char, Conditional Formatting, Fast Summary, GetSummary, Report, Reporting, Subsummary, Summary, Virtual List on September 22, 2013 by Kevin Frank. One of the best ways to learn about a particular FileMaker feature or behavior is to build a demo. You might build one in response to a client request, or to try to answer a question somone has asked, or just to see what happens. 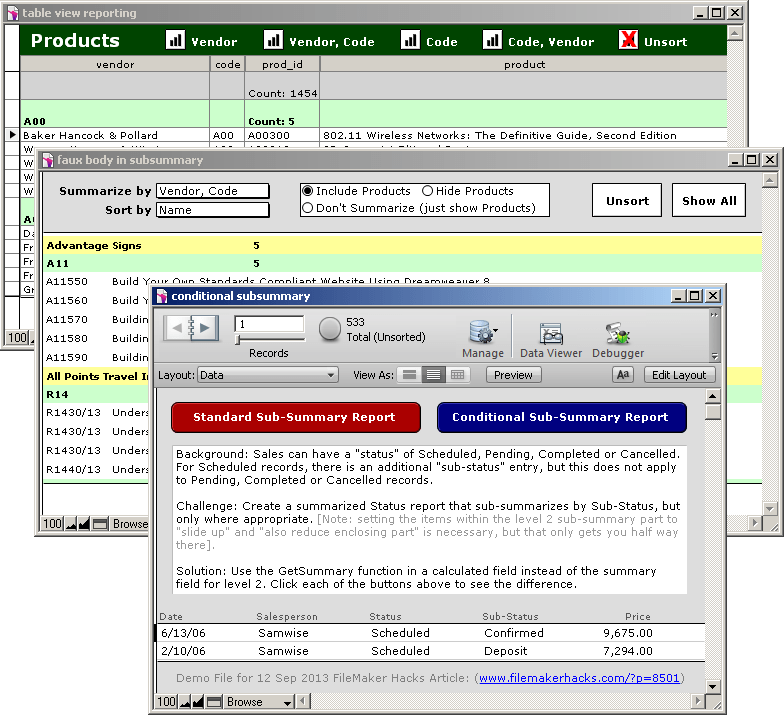 At any rate, today we’re going to look at three demos, each of which explores some aspect of summary reporting. For reasons of backward compatibility today’s demos are in .fp7 format, but you can convert them to .fmp12 format if you are so inclined. What these three demos have in common is multiple sub-summary parts on reporting layouts… so what you see on the report depends on how you sort it. This entry was posted in Level: Intermediate, Version: FM 10 or later and tagged GetSummary, Report, Reporting, Sub-summary, Subsummary, Summary, Table View on September 12, 2013 by Kevin Frank. Last October I began a series on Outer Joins, which explored a number of different ways to display summarized information in a grid, and at the time I concluded that the “fastest” method was to leverage the FileMaker relational model. And it was plenty fast, locally… and not too bad on a LAN… and technically, it was the fastest method on a WAN but only because the other methods we looked at were even dog-slower than it was. I like to test solutions on a WAN, even if they’re only going to be deployed on a LAN, because it’s a great way to uncover performance bottlenecks. But recently I needed to deploy a summarized grid on a WAN, and was incentivised to come up with something faster… and after a bit (well, okay, a lot) of trial and error settled on the approach we’re going to look at today. To cut to the chase, with a million records in the test file, the previous best grid rendering time of 11 seconds on a WAN has been reduced by a factor of 10, to just over one second. This entry was posted in Level: Advanced, Version: FM 12 or later and tagged Dynamic Variable Instantiation, Fast Summary, Get(CalculationRepetitionNumber), GetNthRecord, GetSummary, Repeating Field on May 27, 2013 by Kevin Frank. 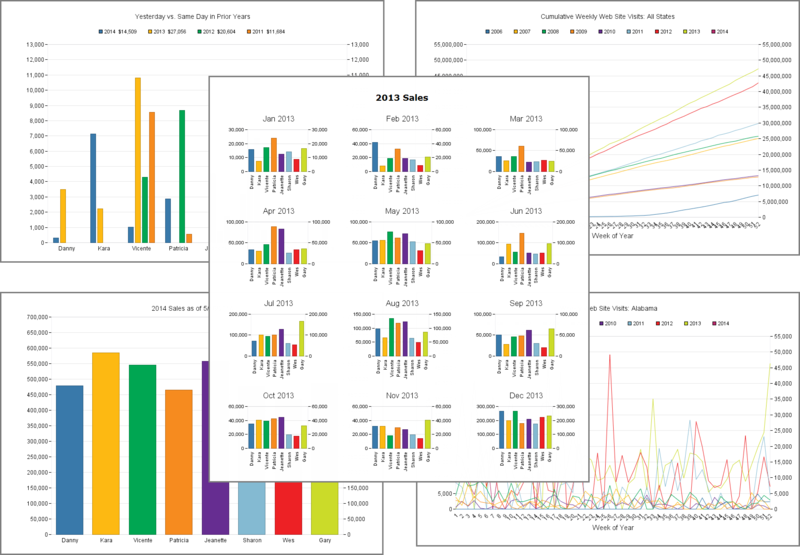 Last week we looked at building a FileMaker 11 native chart based on data that has been parsed into a field-based array. 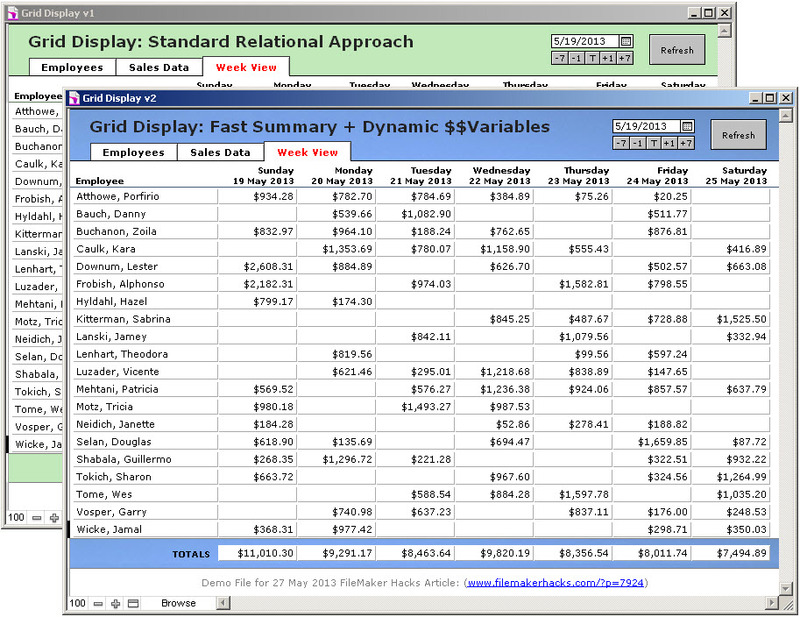 This entry was posted in Chart, Level: Advanced, Version: FM 11 or later and tagged Array, Chart, Dynamic Variable Instantiation, Fast Summary, GetSummary, Line Chart, ValuePosition on July 14, 2011 by Kevin Frank.